George Simpson's wife kept diaries of her travels. Read some excerpts - type 'Frances' into the search box to your left. Check the Beaver Index - e.g., 'Beaver Club,' or 'George Simpson,' etc. The Beaver Club was formed in 1785 by a number of wintering partners who were associated with the North West Company, the trading rival of the Hudson’s Bay Company until the two amalgamated in 1821. At this time, Montreal was the centre of the fur trade. The core of the membership was composed of those fur traders who had spent at least one winter in the interior. Members also included wealthy fur merchants and retired traders. Honorary members were ships’ captains and army officers. Guests, often representing the elite of society, were also invited to meetings. These gatherings and associated dinners were held in the winter months and were renowned for their revelry. The club was active from 1785 to 1804 except for brief revivals in 1807 and 1827. It declined in importance as Montreal’s role in the fur trade diminished. George Simpson received his medal in 1820, a year before the amalgamation of the North West Company and the Hudson’s Bay Company. 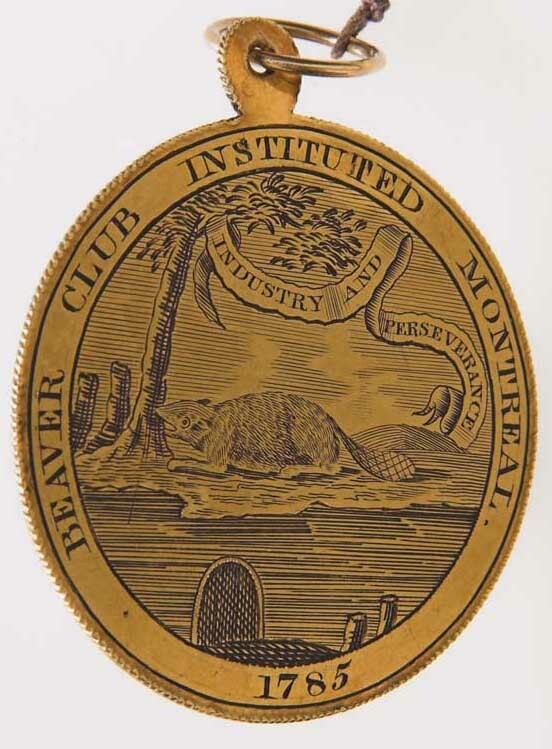 The motto of the Beaver Club was “Fortitude in Distress,” and the words were engraved on a gold medal. Members were required to wear their medals on special occasions and at the meetings.